“People travel to faraway places to watch, in fascination, the kind of people they ignore at home,” wrote philosopher Dagobert D. Runes. Your assignment, Virgo, should you choose to accept it, is to refute that assertion. In other words, I’m inviting you to travel to all of your usual haunts and treat everything that happens there with the attitude of a first-time visitor. Just assume that the familiar people and places in your life have stimulating gifts to give and lessons to impart. Remember, though, they can’t do that to the fullest unless you expect them to. Horoscopes here. 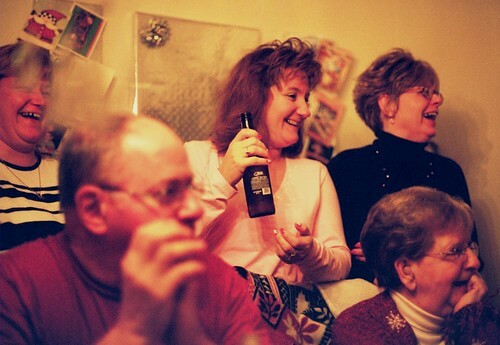 Photo: Christmas 2005 (35mm film). This entry was posted in People, Places and tagged family, holidays, personal. Bookmark the permalink.